On arrival collect your old penny to pay the conductor your tram fare, and receive a ticket you can use all day. Trams depart regularly from town end, calling at various stops along the mile long track. Step back in time and enjoy some traditional seaside fun including an onsite funfair. Find the recreated period style street where you won’t have to wait long for the rumble of a vintage tram. Many of the buildings along the street have been rescued from towns and cities across the UK. Don't forget the indoor displays such as the Stephenson's Discovery Centre and the interesting Exhibition Hall. Please note that unlimited tram rides are included in the entry ticket but there may be an additional charge for additional onsite attractions during this event. 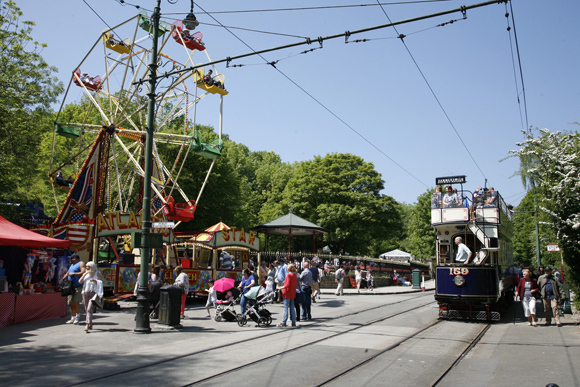 ** Admission to Crich Tramway Village with unlimited vintage Tram rides, Tram depot, Exhibition Hall and the woodland walk. NB. Please note that unlimited tram rides are included in the entry ticket but there may be an additional charge for additional onsite attractions during this event.